Why do we suddenly find ourselves on shaky ground when we feel less concerned about a flight? Why is it more comfortable to expect the worst than the best? Freud suggested we expect the worst to keep it from happening. He said the problem when first having a traumatic experience, is that we never had one before. It comes “out of the blue.” It crushes us. To avoid feeling that again, we brace ourselves by expecting awful things. If an expected awful thing happens, at least we won’t be surprised. Being braced for disaster isn’t enough; we want to prevent disaster. Things don’t just happen: they are caused. What caused the trauma? Searching for what caused the trauma, we look at what was happening just before it hit. Maybe what was going on just before it happened is what caused it. Just before it happened, we were happy and relaxed. We had not thinking that something might go wrong. We gives us the eureka moment; we have broken the code. We suddenly understand that what causes awful things to happen is being happy, and not thinking about what could go wrong. Now we know: a traumatic experience is caused by being happy, relaxed, and not worrying. In order to prevent trauma, we have to avoid being happy, being relaxed, and not worrying about things. We must avoid letting our guard down. The key to keeping bad things from happening is expecting them. Those three things – we think – give us control. Well, not completely; disaster still could take place. But being happy, relaxed and unworried is a sure way to bring disaster to our doorstep. Give up your pessimism, give up your expectation the plane will crash, give up your expectation of some awful disease, and it will happen for sure. When I was in the Air Force in Germany back in the 1960s, we flew our jet fighters across the Mediterranean to Libya every six months to practice shooting the guns, firing rockets, and dropping bombs down in the Libyan desert where, if we missed the target, no harm was done. This was before Colonel Qadhafi came to power. In the sixties, Libya was more like Saudi Arabia is now. It was a kingdom. It was ruled by King Idris. As an ally, the United States maintained an an air base near Tripoli. There was a powerful radio station in Egypt broadcasting messages of hatred toward Jews. Though Jews had lived in Libya for generations under pre-WW II Italian influence there, things got difficult for them in the 1960s. Still, just as in Germany before WW II, many Jews believed things would get better. But some were less hopeful. They left the country after transfering their property to relatives or friends, in case they could someday to return, reclaim their property, and resume life there as before. Some of the Air Force personnel station at the air base rented houses from a bachelor named Mamus Halfon who was, so to speak, “holding the bag.” He held title to properties transferred to him when friends and relatives left. In time, Mamus ended up with millions of dollars worth of property. He was trapped in Libya by the properties that had been entrusted to him. If he left, the properties would be transferred to the government. When I was in Libya periodically for gunnery training, I used to visit Mamus, who kept a tiny shop in Suk el Turk, the old Turkish market. Mamus told me about “The Hand of Fatima” (in Hebrew, hamesh hand, or Hand of Miriam, see http://www.luckymojo.com/hamsahand.html ) which is supposed to ward off evil. Mamus told me he believed in the “evil eye.” He believed the evil eye watched and waited for a person to proclaim their good luck, or to say everything is fine. He told me his friend across the walkway didn’t believe in the evil eye. He said his friend once remarked, “All the other Jews in the market have had rocks thrown through the windows of their shops. But not my shot. I’m lucky.” Mamus said the very next night his window was shattered. This, Mamus, believed was proof that saying everything is fine causes disaster. We know – logically – this is not true. But emotionally, it may be different. Many people I have worked with on fear of flying are worried that – if they don’t worry about the plane crashing – that that will cause it to. But, of course, the very worry that is supposed to prevent the crash is, itself, distressing. Thus, to rid themselves of fear of flying seems reckless. In some cases this operates consciously. In other cases, it is operative at an unconscious level. This means, after a person learns the Strengthening Exercise and practices it, there is a nagging feeling that to feel confident about an upcoming flight is unwise. I’m not so sure it is a good idea to try to swim upstream again centuries of tradition or superstition, particularly when it is reinforced by our own experience, experience like that of Mamus’ friend. So why not keep a worry? But just one. When Intercontinental Hotels build one of their hotels in Africa, they had a problem with the waiters. The men in that area never cut their fingernails. Tradition was that if a man cut his fingernails, he would die. Though extremely long and claw like fingernails were standard in the area, Intercontinental Hotels catered to Westerners, who, when dining, we taken aback by waiters with foot-long fingernails. So the hotel manager consulted a local shaman. The shaman told the manager that the men could cut their fingernails so long as they left one uncut. The hotel paid the shaman to make it official. The waiters were told authoritatively by the shaman that one uncut nail would be more than adequate. So The Moral Of The Story Is . . . If we can see through the myth that expectation of disaster helps prevent it, maybe that will allow us to take the risk of being happy, relaxed, and unworried. But if that is too be a risk, consider what the shaman said: one uncut fingernail is enough. So, why wouldn’t one worry be enough. So pick one worry and stick to it. Worry only until the seat belt sign goes off. Or, worry only until the nose comes off the runway. Or, worry only for the first five minutes, or until you count to one-hundred. One worry is no big deal. It’s a small price to pay for protection against the evil eye. Or, outsource it. Let the captain worry. Why should you worry without getting paid for it when someone else is getting paid big bucks to do that? 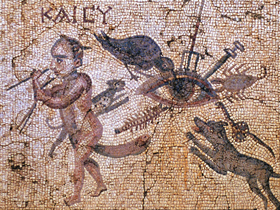 Photo: A Roman-era mosaic depicting devices against the evil eye.